It’s Happening AGAIN…Why Am I Sweating SO Much? It is happening again. People are “working harder”? or so they think! Every year around this time I get the question below…so I’m reposting. If you forgot the answer or never saw…check out the below! But the rate at which water—or sweat—evaporates depends on how much water is already in the air. On dry days, sweat evaporates quickly, which means it also carries away our body heat faster. On humid days, when the air is already saturated with water, sweat evaporates more slowly aka you get extra HOT and SWEATY. 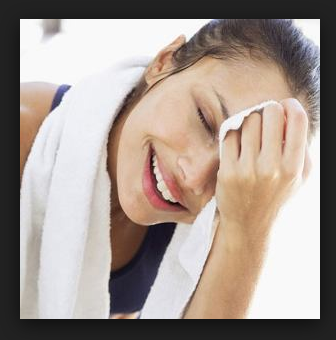 True or False, if you sweat more you are working harder. The answer would be FALSE, not only due to the above information on humidity, but it also has to do with each individual’s body. If you are an athlete your body is most likely more proficient in cooling itself, these people sweat…A LOT! You know that guy sitting next to you in class and is dripping in minute one…that’s him. It’s a practice thing and it’s also a bit genetic…some people are natural sweaters and really good at keeping cool (at least their bodies)! To help athletes stay cool in extremely hot and humid conditions, engineers have developed special clothing that wicks (carries) moisture away from the skin. The clothing pulls sweat off the skin through tiny channels in the fabric and deposits it on the outside of the fabric where it evaporates. Fabrics that do not wick moisture away from the skin, like cotton, simply soak up the moisture and retain it—leaving you feeling soggy and hot. Where Does All the Sweat Come From? I make a point to always remind my classes and now I’m reminding YOU to replace all the water your body with WATER. After sweating we need to replenish our bodies. We are made up of (depending on hydration levels) 70-50% water and we need to keep hydrated to allow our body systems to perform at peak levels. Get to the water bubbler, My People!